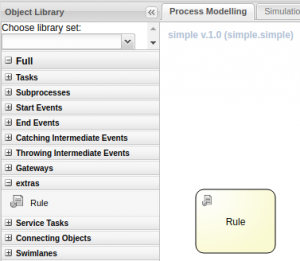 Red Hat JBoss BPM Suite offers a really flexible BPMN engine that can be extended with Custom Reusable Services. Most users know them as Work Item Handler (the technical implementation name), but few of them know that it’s possible to expose them in a comfortable list of reusable services. In fact, you can create a repository of services and simplify the life of the BPMN designer that can easily pick and choose the right service. Another advantage of this approach is that the BPM designer hasn’t had to get down to the nitty-gritty of the configuration, because the import procedure addresses almost everything for you, so you need to focus on consuming the service through a clean interface. To make the magic happen, the service developer has to prepare the service repository. In doing that you enable the rest of the organization to reuse your work item handlers in a simple and clear manner. But even if the service developer is not planning to share these services across the organization, they can leverage the service repository to simplify the work item handler installation across the internal team. You could argue that even creating the repository structure requires some care, but the great benefit is that this effort is done once and reused across multiple projects. The service provider manages many configuration details while the service consumer can disregard them. 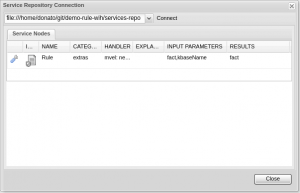 The Service Repository is basically a static directory structure that can be served through an HTTP server, or a plain file system accessible by the Business Central. The index.conf contains the list of folders (the name MUST match exactly the folder name). Here a sample of a github project containing a service repository. Sharing a Service in a repository encourages the reuse and clarifies the separation of roles between the process designer and the service developer. Red Hat JBoss BPM Suite promotes this good practice.